Sold to Saanich to be kept in perpetuity as a bird and nature sanctuary, this 9.3 acre gem was acquired in 2005. Since then, volunteers have assisted with its restoration and maintenance under the guidance of Saanich Parks in partnership with the HCP. Learn about the park’s naturalist and horticulturist owner, her development of the park’s landscape, its natural history, plant and bird species, and ongoing restoration activities. Toss out those geraniums! Through demonstration, learn how to plant a salad box and successfully grow companion veggies, herbs, strawberries and more! Tips for food and floral container growing, including soil mixes, irrigation and fertilizing for these special conditions. Lynda Dowling currently specializes in helping her gardening clients create their own patio and rooftop gardens with flowers plus edibles. The current issue of the Gardenry newsletter is available. 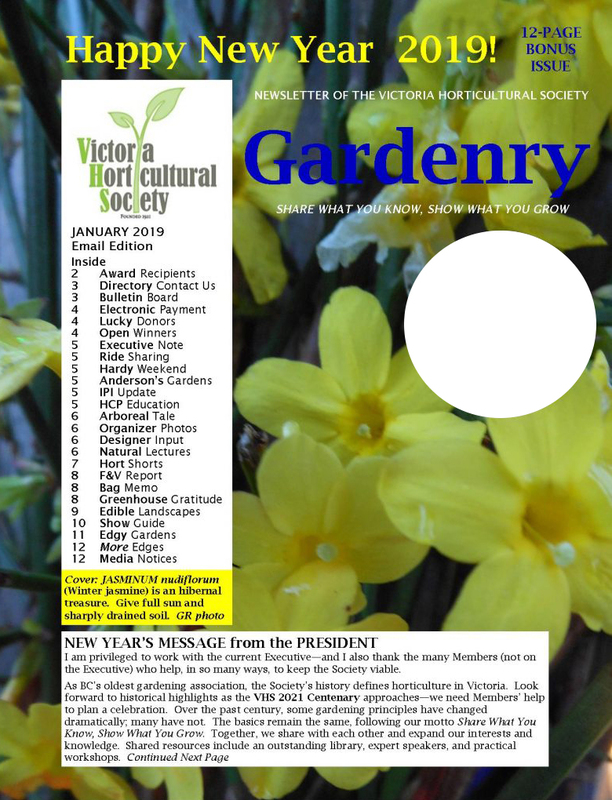 To view the entire newsletter please join the Victoria Horticultural Society. Check out these guides for more details. We’re on Facebook — Visit us, Like us! Not a Member? Join Us! The VHS welcomes new members.